Known as a journalist who gets things done, Jon Ronson is called quickly when neurologists all over the world all receive the same baffling book. Ronson uncovers the perpetrator with little difficulty, but his involvement in the hoax gives him an insight into another phenomenon: the impact of madness on our every day lives. During the course of his investigation, Ronson meets neurologists who deal with psychopathy and becomes particularly interested in the theory that nearly every aspect of our lives is shaped by the influence of psychopaths, particularly those who seem to be in positions of power in disproportionally large numbers. 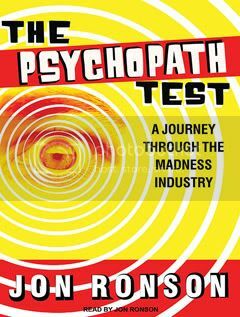 Armed with Bob Hare’s Psychopathy Checklist, known in many circles as the Psychopath Test, Ronson ventures out among a variety of people, all with apparently psychopathic tendencies to see what he can learn. The title of The Psychopath Test is ever so slightly misleading. Ronson is not truly exclusively interested in psychopaths, but in madness and how it shapes the world, and our reactions to it – the case that led him to this topic did not directly involve a psychopath at all, in fact. However he finds over the course of his investigation that psychopathy is the most influential of madnesses, so it fittingly takes a place of prominence in his research and the resulting book. The study of psychopaths truly is fascinating. At one point, another psychologist complains that Bob Hare – of checklist fame – speaks of psychopaths almost as if they were a separate species, Homo psychopathis, or something. There were many times throughout the book when the same thought occurred to me, not as a criticism, but as something that sent shivers down my spine. Still, though, by the end of his research, Ronson has learned not only a respectful fear of psychopaths, but a healthy dose of skepticism about our method for identifying them. Contrary to the ‘separate species’ remark, psychopathy is not an all or nothing proposition, but instead it is a spectrum. At what point are you a psychopath? For most intents, someone who scores a 30/40 on Hair’s checklist is so classified, but what about someone who scores a 29? Is that so far from a 31? One thing I do wish had been addressed by Ronson and his research, even if only fleetingly, is the prevalence of male vs. female psychopaths. Unless I am much mistaken, each of the people in whom Ronson and others diagnosed psychopathic tendencies was male. We know that psychopaths comprise approximately 1% of the population, but it would have been interesting to see how that breaks down on gender – and other socioeconomic – lines. Is the faulty amygdala primarily a male defect, or did Ronson merely have a faulty sample? In The Psychopath Test, Ronson narrates his own work. His voice does take some getting used to, but he is not half-bad, as narrators go. He is perfectly capable of inserting appropriate excitement and emotion into the text. Particularly attractive is his narration of his own anxieties, oftentimes nearly crippling. Because he inserts himself so completely into his narrative, it makes complete sense for him to do the actual narration when the text is translated into an audiobook. The experience is made that much richer by his familiarity with the text and ability to impart the full range of emotions he felt during this period of research. The Psychopath Test is a fascinating work of extremely narrative journalistic nonfiction. 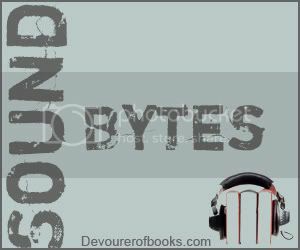 Readers and listeners alike will be more than a little horrified by the psychopaths who lurk everywhere around us, mimicking our emotions though they feel none themselves. I would recommend The Psychopath Test in either print or audio, but be prepared to begin measuring everyone you meet against the Hair Checklist.